The bridal shower umbrella is an idea started years ago, by friends and family members. It was to help the bride-to-be as she prepared for her upcoming wedding. Items would be placed in a parasol, and when opened, the gifts would "shower" upon her. This custom has gone through some changes, but the thought behind it remains the same. Whether you are hosting an old fashioned party or a non traditional event, there are many ways to incorporate this design into your party. Scan the following tips, and see if you discover a suggestion that would work for your party. • You can select an invitation with this design. You will be able to find these in both contemporary and traditional styles. • Wrapping paper can be found with this design. In fact, most paper made specifically for bridal showers will feature this symbol. • A vintage bridal shower umbrella in a color to match your decorations can be used as a centerpiece. 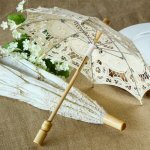 • Parasol themed paper goods are available. • The cake can be designed in this shape. You can also purchase or bake any shaped cake and decorate it with this idea. • Serve decorated umbrella cookies. These can be special ordered at your local bakery, or found online. • You can select chocolate bars as your favors. Choose a label that incorporates this design with your party colors. • Make mini chocolates using molds with this shape. Display in candy dishes on tables, or give as take-home favors. • Bath soap favors with this pattern are a cute idea. • Parasols come in a variety of colors, and work well with most themes. A vintage or Victorian theme could definitely showcase these. • Incorporate with A "Spring is Sprung" theme. • Use big umbrellas for an outside beach party. • Display parasols for an Asian theme. • Colorful toothpick umbrellas can be used to adorn tropical drinks, or food platters. These are great accents for a beach or luau theme party. • Straws come in a variety of colors, in this shape. • Songs such as "It's Raining Men", can be used to reinforce this idea. *** You're sure to think of other ways to use this symbol of well-wishing and happiness. • Do you need some other decorating ideas?